The Gozzard 36E, designed by H. Ted Gozzard, and built at North Castle Marine in Ontario, Canada is perfectly suited for a cruising couple seeking a traditionally styled blue water sailing vessel. It's manageable size, flexible cutter rig, modest draft (4' 9"), robust construction, skeg protected rudder and innovative interior arrangement are just a few of the attractive features of this vessel. The most distinctive feature is the innovative open plan. Ted Gozzard designed a uniquely functional and flexible plan, enabling an open main salon by day to become a roomy private stateroom by night. 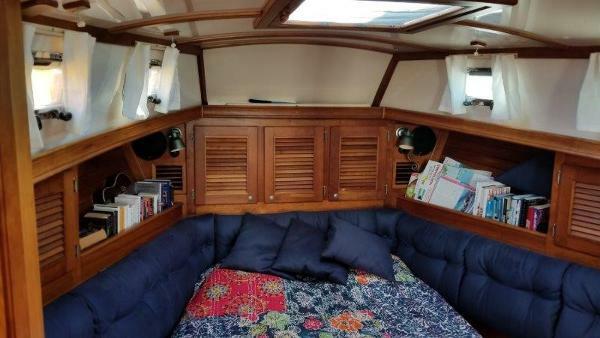 It's a refreshing twist on the traditional sailboat layout that is ideal for a couple with occasional guests. Kairos just returned from the Bahamas and she is ready for new adventures. She's in excellent condition and will not disappoint.